This interesting name has a number of possible derivations. Firstly, it may be of early medieval English origin, from a nickname for a short, rounded person, derived from the Middle English "bal(le)", ball, a development of the Olde English pre 7th Century "bealla", and influenced by the Old Norse "bollr". In some cases the nickname may have referred to a bald man, from the same word used in the sense of a round, hairless patch on the skull; interestingly, the modern English term "bald" derives from a contracted form of the Middle English "ballede", from "bal(le)" with "-ede", that is, "having a balle". 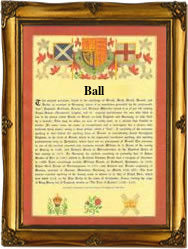 Secondly, the surname Ball may be topographical in origin, from the same term, "bal(le)", used in the transferred sense of denoting someone who lived by a knoll or rounded hill. Finally, Ball may derive from the Old Norse personal name "Balle", of obscure etymology, but believed to be derived from "bal", torture, pain, or the Old German personal name "Balle", from "bald", bold. Early recordings of the name from each of these derivations include: Robert le Bal (1296, Sussex); Henry atte Balle (1327), Somerset); and Norman Balle (1183, Northamptonshire). One Robart Ball was a very early emigrant to the American colonies; he is recorded as resident in Virginia in 1624, having arrived in the "London Marchant" in 1619, a year before the arrival of the "Mayflower's". The first recorded spelling of the family name is shown to be that of Godwin Balle, which was dated 1137, in the "Early London Personal Names", by E. Ekwall, during the reign of King Stephen, known as "Count of Blois", 1135 - 1154. Surnames became necessary when governments introduced personal taxation. In England this was known as Poll Tax. Throughout the centuries, surnames in every country have continued to "develop" often leading to astonishing variants of the original spelling.